NEW ORLEANS – Regional Athletes and Coaches of the Year for the 2018 NJCAA Division III Outdoor Track & Field season were announced Wednesday by the U.S. Track & Field and Cross Country Coaches Association (USTFCCCA). Each of the three regions honored both genders’ top track athletes and field athletes, and the top men’s and women’s head coaches and assistant coaches. 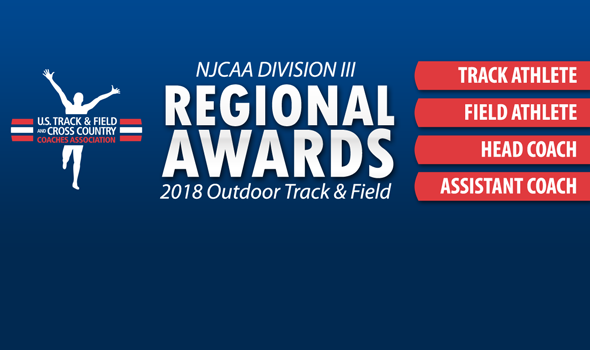 Many of the honored athletes and coaches will be at the 2018 NJCAA Division III Outdoor Track & Field Championships this weekend in Utica, New York. Taylor, a freshman, is ranked first nationally in both the 5000 and 10,000. His time of 15:27.74 in the 5000 leads the nation by nine seconds. His time in the 10,000 leads the nation by one minute. Taylor is also ranked fifth nationally in the 1500 at 4:08.56. Wall, a freshman from Huntsville, Alabama, is ranked in the top-5 nationally in two individual events (400 and 800) and one relay (4×400). He currently leads the nation in the 400 with a time of 48.88. Wall was named the USTFCCCA NJCAA Division III Men’s National Athlete of the Week on April 3. DaSilva, a sophomore, is ranked in the top-5 nationally in three different individual events: the 800 (1st), the 1500 (2nd) and the 400 hurdles (2nd). He is ranked first in the region in all three events and was twice named USTFCCCA NJCAA Division III Men’s National Athlete of the Week this season (April 10 and April 24). Kelly, a freshman, is ranked first nationally in both the long jump and the triple jump. His mark of 14.50m (47-7) in the triple jump leads the nation by more than four feet. Kelly’s leap in the long jump (7.01m/23-0) is tops in the nation by four inches. Hunt, a freshman from Collingswood, New Jersey, is ranked in the top-5 nationally of the discus, shot put and hammer. He is the national leader in the discus with a heave of 48.70m (159-9) and was the only NJCAA athlete invited to participate in the Penn Relays in that event. Hunt is ranked third in the hammer at 40.90m (134-2) and fifth in the shot put at 12.90m (42-4). Gonatas, a sophomore from Fort Salonga, New York, is ranked first nationally in the shot put and second nationally in both the discus and hammer. His mark of 13.70m (44-11½) in the shot put leaves him on top of the Descending Order List by more than one foot. Olsen, in his second season at Triton (Ill.), guided the Trojans to a first-place ranking in the Central Region. His squad will enter the NJCAA Division III Outdoor Track & Field Championships with 16 performances ranked in the division’s top-10. Hughes, in his 14th year at Rowan-Gloucester (N.J.) CC, has kept the Roadrunners ranked first in the East Region, as well as nationally, all season long. His squad owns the top mark in five NJCAA Division III events this year. French, in his seventh season at Suffolk County (N.Y.) CC, has had athletes hit 30 qualifying marks for the NJCAA Division III Outdoor Track & Field Championships this year. His team has sat in first place in the Northeast Region throughout the entire season. Hayes has assisted with the Triton’s first-place ranking in the Central Region all season. Hayes’ athletes have posted six top-10 NJCAA Division III marks in the 100, 200, 110 hurdles and 400 hurdles this season. Getsinger, in his fourth year at Rowan-Gloucester (N.J.) CC, has coached the top 110 and 400 hurdlers in NJCAA Division III this season. He has tutored a stable of athletes who have posted 12 top-10 NJCAA Division III marks in the sprints, jumps and hurdles events. Nicholson helped guide the Wave to the No. 2 ranking in both the Northeast Region and the USTFCCCA National Team Rankings. His athletes are ranked first in the nation in the 100 and 200, and he also boasts two other top-five athletes in both the 200 and 400. Cook, a sophomore, is ranked first nationally in both the 800 (2:21.80) and 1500 (4:57.70). In the 800, she tops the Descending Order List by two seconds, compared to three in the 1500. Cook was named the USTFCCCA NJCAA Division III National Athlete of the Week twice during the outdoor season (April 3 and April 24). Chinedu, a freshman from Freehold, New Jersey, is ranked in the top-5 nationally and regionally in three different events. She is No. 1 in the 400 hurdles with a time of 1:04.61, second in the 100 hurdles in 15.67 and fourth in the 200 in 26.57. Rouse, a sophomore from St. Vincent and The Grenadines, is ranked first nationally in three individual events and helped out on two top-ranked relay teams. She owns the top marks in the 100 (12.29), 200 (24.99) and 400 (58.35), while chipping in with the 4×100 and 4×400. Rouse was named the USTFCCCA NJCAA Division III National Athlete of the Week on April 10. Szelazek is ranked first nationally in the javelin with a mark of 38.50m (126-3). She leads the nation by 15 feet thanks to her winning throw at the Wheaton Invitational on April 7. Lancaster, a freshman from Glassboro, New Jersey, is ranked first nationally in the shot put, discus and hammer. Her best mark in the shot put of 13.39m (43-11¼) is the NJCAA Division III record. Lancaster is close to the NJCAA Division III record in the discus with her heave of 40.44m (132-8) and owns a personal best in the hammer of 43.30m (142-0). She was named USTFCCCA NJCAA Division III National Athlete of the Week twice during the season. Belles, a freshman from Clay, New York, is ranked second nationally and first regionally in the heptathlon (2074 points) and high jump (1.52m/4-11¾). She is the only woman in the Northeast Region to lead the region two field events. Macnider, in his fifth year as head coach at Harper (Ill.), has coached his Hawks to 12 top-10 NJCAA Division III marks during the season. His squad is ranked first in the Central Region, as well as third nationally, and Natalie Cook has captured two USTFCCCA National Athlete of the Week honors under his watch. Hughes, in his 14th year at Rowan-Gloucester (N.J.) CC, has kept his Roadrunners ranked first in the region and nationally all season long. His women own the top marks in four events in NJCAA Division III, as well as five second-place rankings. Loobie, in his 18th year at Kingsborough (N.Y.) CC, has coached his women to 22 top-10 NJCAA Division III Descending Order List marks this year. His Wave own the top spot in the Northeast Region while also ranking second nationally. Wallor, in his eighth year at Harper (Ill.), has coached his distance runners to 11 top-10 NJCAA Division III Descending Order List marks. His athletes own the top marks in NJCAA Division III in the 800, 1500, 5000 and 10,000. Kalnas, in his 12th year at Rowan-Gloucester (N.J.) CC, has coached his throwers to 13 top-10 NJCAA Division III Descending Order List marks. His athletes own the top marks in the NJCAA Division III in the shot put, discus and javelin. Nicholson’s women own the top marks in the Northeast Region in five individual track events, three relays and one field event. Shantel Rouse has the top marks in the 100, 200 and 400 nationally, while Nyeria Gordon leads the nation in the 400 hurdles. The Wave’s 4×100 and 4×400 relay teams are also tops in NJCAA Division III.